I am not sure if it's a function of my (advanced) age or just that I am trying to be a happier more balanced individual but at 9pm I am done with being a mom. This is not to say that if the Pearlster woke up vomiting in the night I would say "Sorry my dear, Mom is closed", I certainly would deal with whatever she needed. I am talking about a normal healthy day that begins for me at 6am. I wake up, turn on my CFB bedside lamp, I mention the CFB part because it takes a little while to warm up and emit full strength light. It's like a slow re-entry to consciousness. From 6am until 6:30 I write and organize my thoughts for the day ahead. At 6:33am Pearl's alarm goes off and she clambers down her ladder and stumbles into my room and climbs into bed with me. We snuggle for a few minutes and then I kick her out so she can get ready for school. There are light negotiations around food, bathing, appropriate attire and, speed and efficiency until 7:25am and then we leave for school. At around 8am I am in my office, head down working. Hopefully. Fast forward to 3pm when Pearl arrives back home and Mom is back on duty with homework detail, more food negotiation, exercise ,and endless stories about what the other sixth grade kids are talking about. We watch some TV, drink some wine (me, not Pearl) and by 8:30 or 9 I am ready for the Mrs. Monkey-Pants to slip quietly and efficiently into her bed. Not my bed with me but her own bed. This comes up sometimes. Why can't she sleep with me in my bed. She just can't that's all. I need to sleep on my own. At this point in the day I have nothing left. I almost always want to achieve something in the evening, I make plans to do things. I write these tasks in the margins of my morning pages but when 9pm gets here I often find myself catatonic in front of the TV, a shell of a person. I think a little, but mostly I stare, sometimes in the fetal position from under a quilt. I have nothing left to offer the world, my child or myself. Even the dog can't get my attention, scratching at the door in 3.5 minute intervals. I am a morning person. I wake up early and I wake up chipper. I want to know what lays ahead the minute my eyes open and my feet have hit the floor, I have a plan about any given day. But at night it is another story. I am cranky and lazy, and god forbid I fall asleep and you try to wake me up, I could snap! I won't do the dishes I barely want to brush my teeth, I just want to collapse and be left entirely alone, like rotten fruit. Pearl gets this after years of me politely articulating my limits. She knows I love her, I just need to take down my Mom shingle between 9pm and 6:33am. Maybe it's harsh, but it's honest. I can't be on all the time, but when I'm open for business, I am all hers. Took some time yesterday and printed 40 of these cards. 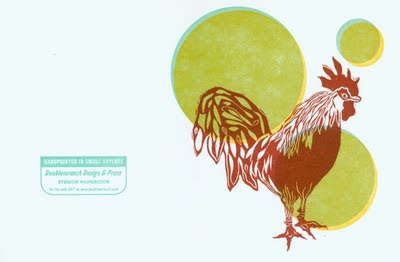 The Rooster image is one I cut myself, using a lino block, I printed it and scanned it and then had a smaller metal plate made. I still marvel at the fact I can make something by hand, transfer it to my computer, send it to a place in far away East Texas and print it again when it comes back. Magic. I also use polymer plates but find they don't hold up over time. The edges curl and they lose their sticky quality. This is the same rooster I have stuffed in my living room. I also have a print of him for sale on my website and at Etsy. Will post the cards for sale there too. Stay tuned. No time for blogging. Trying to keep working in the face of my new schedule with Pearl. Vaguely mourning the loss of my time with Mark. This fall weather is amazing and I have been compelled to do some odds and ends out doors in preparation for winter. Thinking about letterpress printing some pieces, poured concrete today but felt frustrated by how poorly I plan things sometimes, most of the time. No negative thoughts, they are unhelpful. Thinking about a story of a woman with stage 4 ovarian cancer who is challenging people to not have a single negative thought for 21 days. Is it possible or even desirable? I don't know. Holy cow! How does an entire week go by without a single blog entry. Monday there was a dead hen, partially eaten by a raccoon. Tuesday I was nauseous. Pearl stayed home from school on Wednesday and it rained hard. I felt crappy and slept in the afternoon. Thursday was okay. Friday I went to town early and took care of many of the mundane details of my life and didn't get any billable hours in. Shameful. 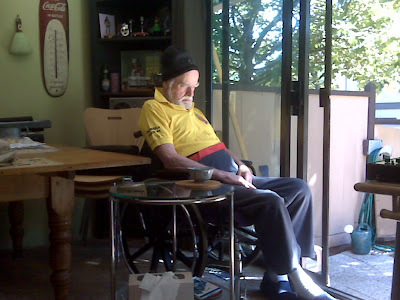 Saturday I went into Vancouver and saw my dad and stepmother and was cranky and tired when I got home. Today is Sunday again and it's been an entire week since I have had the thought to write something here. Eddy asleep in the sun. Mark started his course this weekend. It marks a new period for us. Gone are our carefree weekends for the next few months. It's okay because if I have learned anything it is that I am capable of adjusting to change. I looked after Eddy while Mark went to school and then DJ'd a wedding. The wedding was an additional complication but again, not insurmountable. We have also embarked on a new school schedule with Pearl which sees her in Everson during the week and with her dad most weekends. We are in a state of flux which can be disorienting. I could choose to be blue about the whole thing but I refuse to go there. Instead I invited my sister out for the weekend to keep me company while Mark was away. In the morning I cleaned our bedroom and took the dog for a good walk. I tended to Eddy and felt good about doing it. On Sunday Catriona and I walked for about two hours along the dyke at Mission, it was clear and warm and we had a good talk. Mark came home, beat from his weekend of schlepping equipment and doing equations. Catriona went home and we took the big red car out to do the shopping, I made dinner for the three of us while Mark slept. It felt different from the normal routine but not unpleasant. There is a stillness to this change as we all get used to the new order of things. I don't fear change anymore, I look forward to the new opportunities that arise from it. Sept 11, 2001. My neighbor called and told me what had happened at the Twin Towers. I listened to the radio for a bit then told my husband what had happened. We were in the middle of our divorce then. I went down to the barn and brushed my horse for a really long time. It wasn't until a year later that I saw film footage of the whole event. I purposely did not want those images in my head. 2 yrs ago we visited Ground Zero almost by accident and I could not fight back the tears as I read the names posted on the observation deck. I am crying for the loss of innocent life and the lives disrupted by this senseless act. Where are we now on the continuum. We know what others in the world have experienced for years. We have lost our collective innocence, but what are we doing collectively to end the cycle of violence and destruction. It was black at 6am when my alarm went off. Once again I was dreaming about traveling. It seems that is all I dream about lately, traveling with my dad, members of my family, Mark and friends. I layed in the dark for a bit fighting falling back to sleep. Holding the dream and trying to understand what it indicates, certainly not physical travel but more likely the journey that is my life. The trip I am on with my dad is an end of life trip, he is not dying but we are in that phase and it is hard not to think about death when I see him. He will not live forever. He said to me the other day "when I am gone", and I immediately asked him, where are you going? It felt a little cheeky but it just slipped out. You don't want to think about this part of the journey but it's there all the same. The journey I am on with Mark feels more spacious and wide open, filled with possibility. He starts his CMA course this week and eventually when his journey with his dad is complete he will re-enter the workforce and that will be another journey for us. My friends are coming and going, I am gaining new ones and old ones are stepping away, my journey of friendship has always evolved in a pleasing way. Even Pearl's journey as it relates to me is changing, in subtle ways. I no longer walk her into school, choosing instead to drop her at the curb, a quick peck and she is gone. Our paths are running side by side where they used to be firmly a single track, soon she will start turning away, we'll both be ready. No image for today except a bunch of lines running along crossing over each other, turning away, some ending, some starting. The thick and the thin, moving, undulating and pulsing like veins. How are your journey's going? Eddy is confused and emotional today. When I went into his room, he asked me if he had been sick or if he had something wrong with his memory. He is laying in his bed in what must seem like a strange room even though it has been his for 5 years. I tried to reassure him and fill in some of the blank spots but he could not remember my name immediately or who I was. It's upsetting to see him this way at odds with his normal complacent state, it's distressing and sad to hear him articulate what he is feeling rather than just always answering in the standard affirmative when you ask him how he is. It's just hard to see him curled up like a little child, on the verge of tears asking me questions about the most basic points of his life. It must be shocking to have someone tell you, that you're 81 and realize you have little recollection of what you have done in all those years without substantial prompting. At the edge consciousness, we think we know where we are going and where we have been, but there will come a time when it will all feel like a dream. Merrily, merrily life is but a dream, and off we go gently down the stream. Was feeling pretty good. Took Pearl for her first hike up at Mt Baker with friends. It was the last major thing on my list of things to do this summer. I even finished sewing the dress I started and have been wearing it, in public. Like I said I was feeling good and then I learned of the death, from cancer, of woman in my circle of dear female friends from my time in Los Angeles. She was a woman who I used to show my portfolio to periodically. I can't even recall if I ever did any work for her but I do recall that she really encouraged me. She was warm and real, a rarity in LA in the music business. I was lucky somehow and most of the people I knew were authentic, generous folk. So once again I was faced with that feeling of "there but for the grace of god go I". I couldn't sleep, feeling broken hearted for this life cut short and for all her dear friends feeling such deep loss. What can we do except keep going, keep our feet on the ground, hang on and stay here. After my mother died I took a job in Vancouver. I needed to go somewhere and have work handed to me, I could not seek it for myself, I had no energy. I was physically a wreck. The muscles down my back were so tight that when I walked I couldn't feel the ground and my feet ticked. I used to walk from the building where my office was to the train and I had to remind myself to breathe in such a way that I forced my feet onto the sidewalk. After weeks of doing this I started feeling more in touch with the ground. I was so sad that I felt I could have drifted away. I heard two stories recently, one was about the deep salt mines in Michigan and the other was about the space shuttle. On this upside of my general depression I see how comforted I am to just be on the ground. I don't like flying, I see it as a necessary evil. When I hear stories about colonies on Mars I feel sick. I don't want to go into caves or mines either, I want to enjoy the earth from the ground. Walking toward the mountain on Tuesday I was so happy. Sharing the experience with dear friends and Pearl left me feeling deeply satisfied, so when I learned of Melanie Penny's passing late on Wednesday I could hold her memory in my heart, standing on terra-firma wishing her godspeed to wherever she is off to next. Afterall what do we have except this moment and the spot where we are standing.